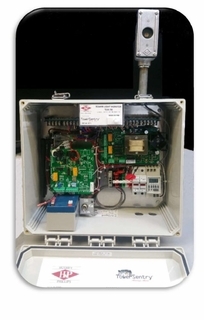 Call for Pricing Use: The 70+TSMS Control & Monitoring system is a single enclosure for operation of our HORIZON™ LED lighting system with Monitoring provided by TowerSentry®. The 70 Series controller is capable of operating as a FAA Type A-1, D-1 or E-1 system. The controller will include a photocell, day/night over-ride switch and simple wiring of power, photocell and tower lights. The TSMS is configured to provide alarms for Power Fail, Mode Status, Beacon & Sidelight alarms, along with Door Open notification. The TSMS can give automatic email or SMS text messages for instant notification of failures, changes in status, or NOTAMs issued by the TowerSentry operators. Use: The 70+TSMS Control & Monitoring system is a single enclosure for operation of our HORIZON™ LED lighting system with Monitoring provided by TowerSentry®. The 70 Series controller is capable of operating as a FAA Type A-1, D-1 or E-1 system. The controller will include a photocell, day/night over-ride switch and simple wiring of power, photocell and tower lights. The TSMS is configured to provide alarms for Power Fail, Mode Status, Beacon & Sidelight alarms, along with Door Open notification. The TSMS can give automatic email or SMS text messages for instant notification of failures, changes in status, or NOTAMs issued by the TowerSentry operators.